1. Cook the pasta in a large pan of boiling water for 10 minutes. Add the flower sprouts and cook for a further 3 minutes until both are tender. 2. Meanwhile, heat the oil in a small frying pan and cook the chorizo, onion and garlic for 5 minutes. Add the chopped tomatoes and chilli and cook for 3–4 minutes until softened and pulpy. Add a ladleful of cooking water from the pasta pan and stir through. 3. Drain the pasta and flower sprouts and return to the pan. Add the chorizo mixture and toss together well. Spoon into 4 bowls, scatter with the grated Parmigiano and serve swiftly. For a crunchy topping, mix a little olive oil into some fresh white breadcrumbs and cook in a large frying pan until crisp and dark golden. 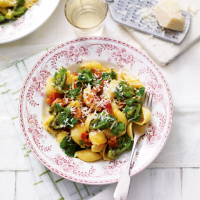 Stir through some chopped parsley or grated Parmigiano and spoon onto the warm pasta just before serving.